Bachelorette parties are once-in-a-lifetime events that deserve commemoration. One of the absolute best ways to show your support for the bride-to-be involves ordering up custom bachelorette party t-shirts in your favorite designs. 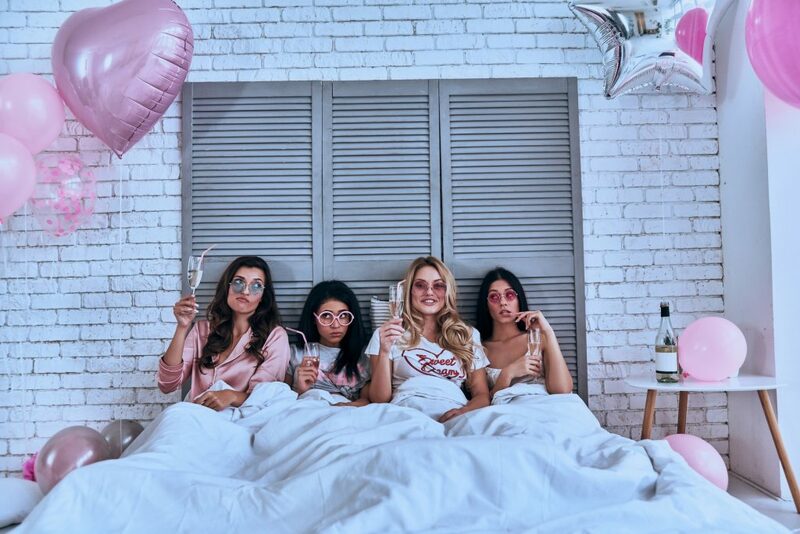 Toronto Tees provides you all the tools you need to be creative, but if you’re struggling to come up with a bachelorette party t-shirt design of your own, the following options might inspire you. If you’re going to be creative and unique with your custom printed bachelorette party t-shirts, one of the best ways to go about it is with some sort of pun. These will definitely catch attention, and they might even catch you a free drink, too. Some good options? Try “Bride’s Last Ride”, “The I Do Crew”, or “I Got the Hubby/We Got the Bubbly” combos to stir up a few good laughs. Choosing a maid of honor and bridesmaids can be tough work, and there’s no doubt that the maid of honor puts in her time with all the planning. After all, she’s usually the mastermind behind the bachelorette party, and there’s nothing wrong with giving her a little recognition. Consider adding the wedding party’s names and titles to the back of the bachelorette party t-shirts, too. This will help others know who to congratulate if you’re going out on a prenuptial pub crawl, as well. When you design a bachelorette party t-shirt, it is customary for the bride’s shirt to truly stand out. One of the most popular ideas involves giving the bride a white shirt that simply says BRIDE in big, bold letters, and fitting the rest of the bridesmaids in black shirts that say “Squad”, “Crew”, or “Bridal Party” in the same font and font color. This helps keep everyone together, but it keeps things simple at the same time. Does the bride to be have an obsession with a certain movie, book, or television show? If so, you can use this to create some of the most amazing custom bachelorette party t-shirts. For example, if the bride is a Harry Potter fan, “From Muggle to Mrs.” is cute and to the point. You might also opt for a female “Fight Club” theme or something a little more Disneyesque, like the Bride and her Seven Maidens, each of whom have their own cute names. Finally, you can channel the ever-popular “Keep Calm and Carry On” meme to create t-shirts with your own cute message. A good example for bachelorette party t-shirt design? The bride’s shirt might say, “Keep Calm and Marry On”, but all of the bridesmaids’ shirts could say, “Can’t Keep Calm – It’s a Party!” or something to that effect. The options are truly limitless. If you need custom printed bachelorette party t-shirts for your big event, Toronto Tees has you covered. You can visit our website and use our simple design tool to create the perfect shirts for the entire party, or you can stop in at one of our two convenient locations to design and print your shirts right away.